Fantasy Mage is now available on indiegamestand.com. To check out Fantasy Mage on indiegamestand.com, click on the link below. 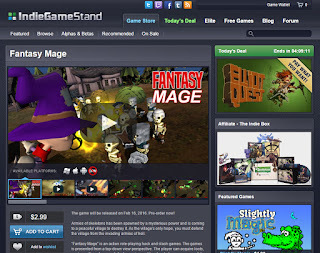 IndieGameStand is a different kind of indie gaming bundle and promotional website. The site is about featuring and promoting a new independent game every 96 hours (4 days) for gamers to purchase at a discounted price. So if you support Indie, you should support IndieGameStand too.